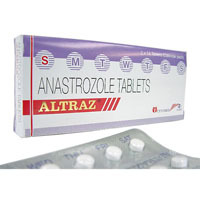 Altraz is produced in the form of tablets. It is widely used in bodybuilding to prevent estrogen-related side-effects (gynecomastia, water retention etc), caused by intake of testosterone or its derivatives. In medical practice it is used for treatment of breast cancer in women and low levels of testosterone in men. Though Arimidex is a powerful anti-estrogen (aromatase inhibitor), by chemical structure it doesn’t belong to steroids. Usually it is used instead of Clomid or Nolvadex at the dosage of 0.25-1mg Every Other Day. For treatment of low level of testosterone the dosage maybe even less. It’s better not use it if you have high sensitivity to anastrozole or to its components. In case of problems consult your doctor. The side-effects of Arimidex may depend on steroid you use. Usually they include headache, weakness, hot flashes, cough, skin rash, increased blood pressure, sweating. Rarely depression, weight gain, breast pain, nausea or vomiting may occur. As an anti-estrogen Altraz (Arimidex) is used during steroid cycles containing high amounts of steroids which are prone to aromatization. If an athlete is susceptible to gynecomastia, it should be used even with medium quantity of these steroids. This drug can be more effective in estrogen reduction than aminoglutethimide (Cytadren), besides it does not possess aminoglutethimide specific side-effects. Arimidex can greatly reduce estrogen level, but blood tests are needed to adjust the dose after 7 days of usage. Its action differs from other aromatase inhibitors, for instance Clomid or Nolvadex. The latter compounds inhibit estrogen receptors in some tissues and activate them in others. Meanwhile Anastrozole works on the whole. While using Anastrozole during steroid cycle there is no necessity to take Clomid, but there are cases when it can also benefit you (for detailed information see Clomid). When the dosage of testosterone is moderate 0.5 mg a day of Anastrozole is usually enough to make good result.